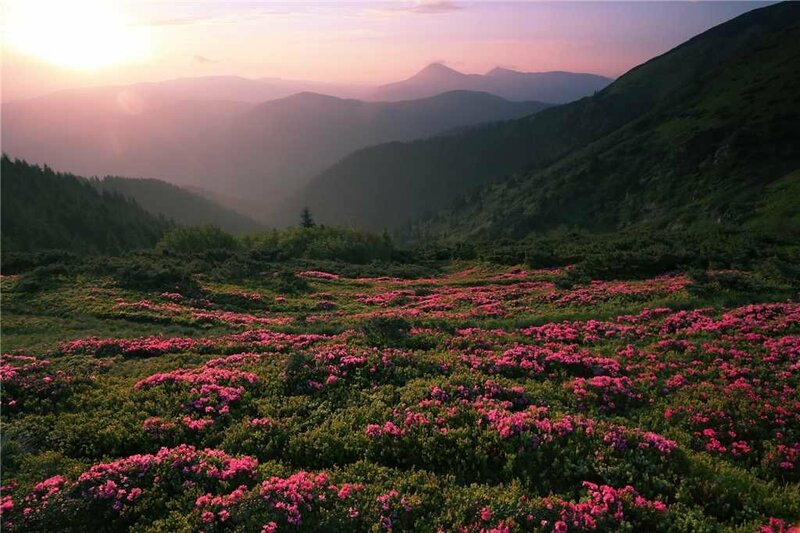 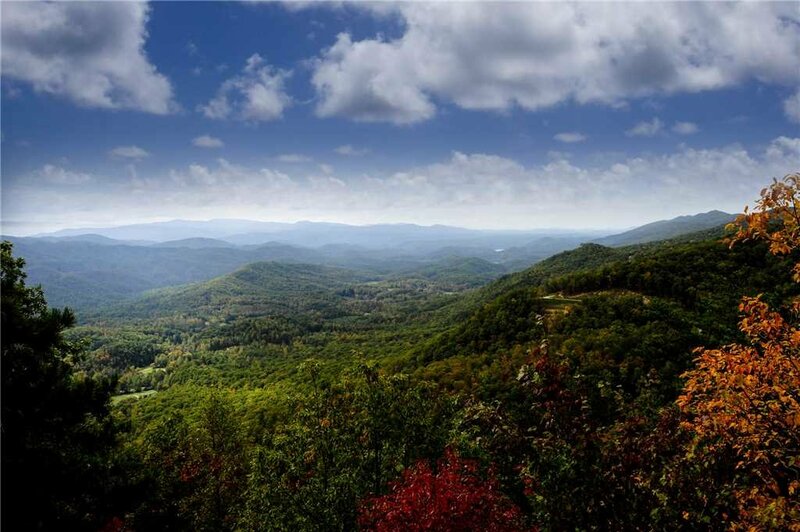 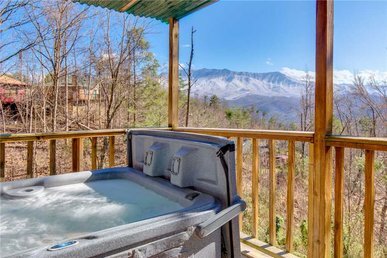 Away from the resorts and high-rise hotels you’ll find Chubby and Cubby’s Den, a newly built mountain cabin that lets you appreciate nature in all its splendor. 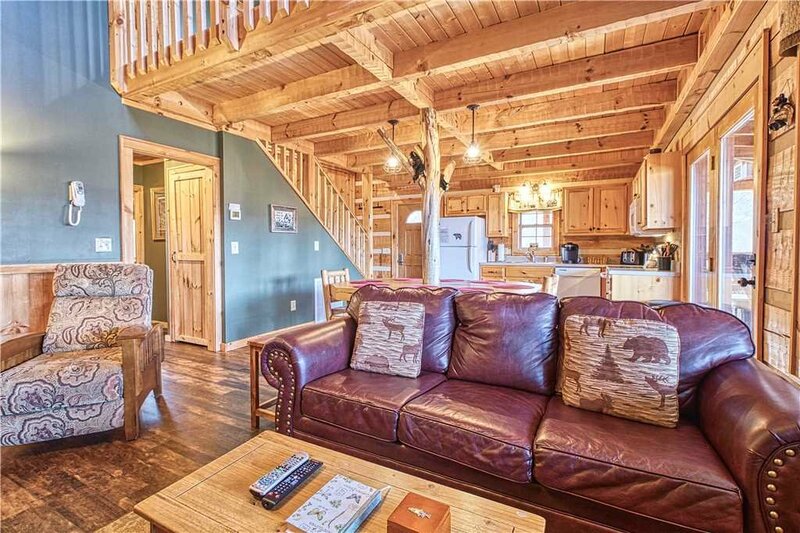 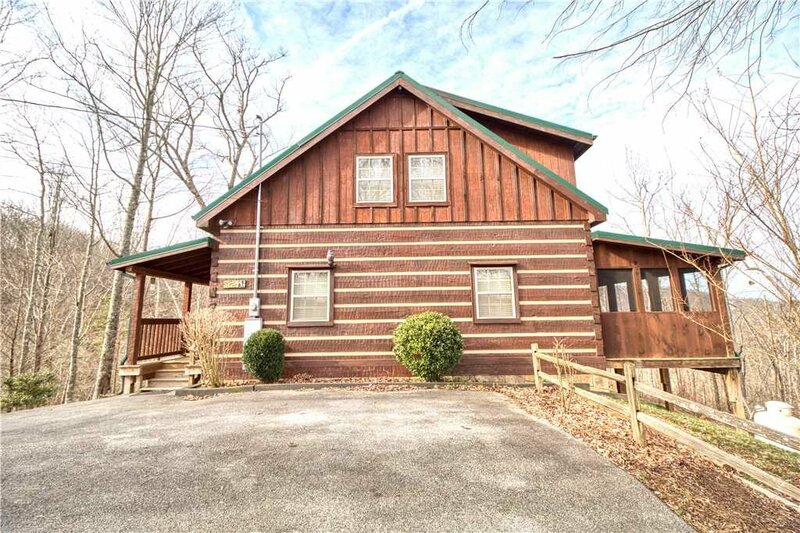 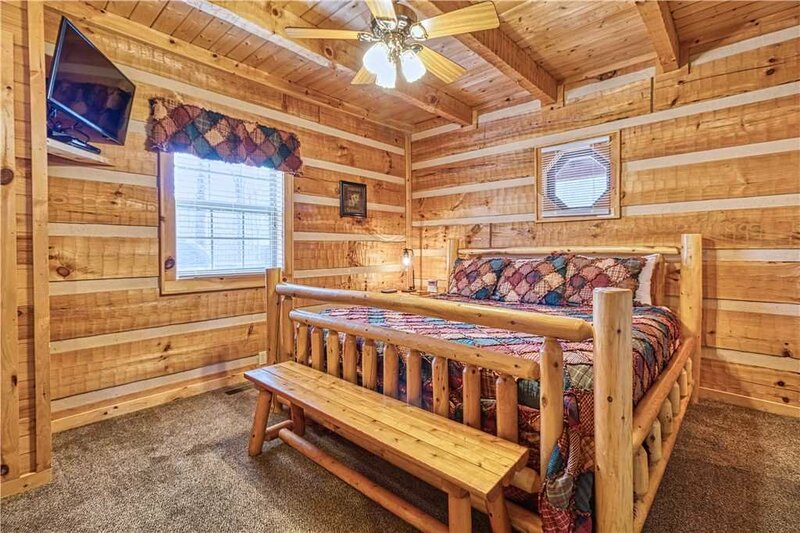 Your log cabin is authentic from top to bottom. 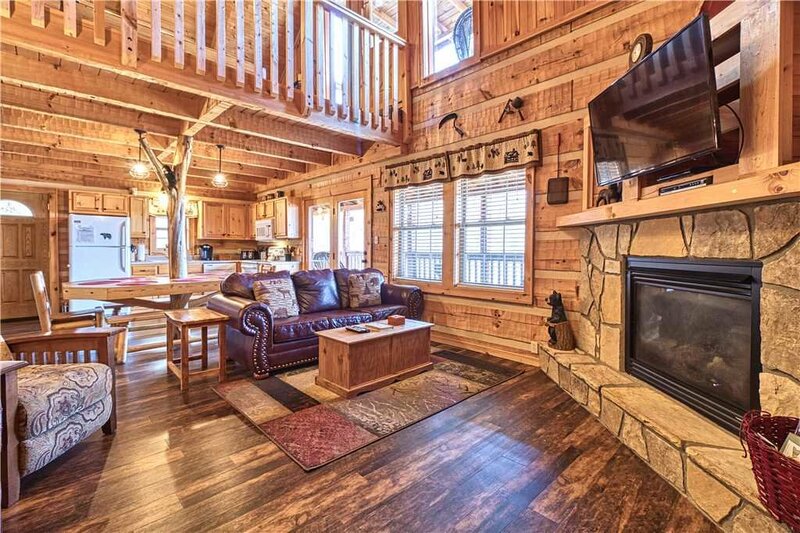 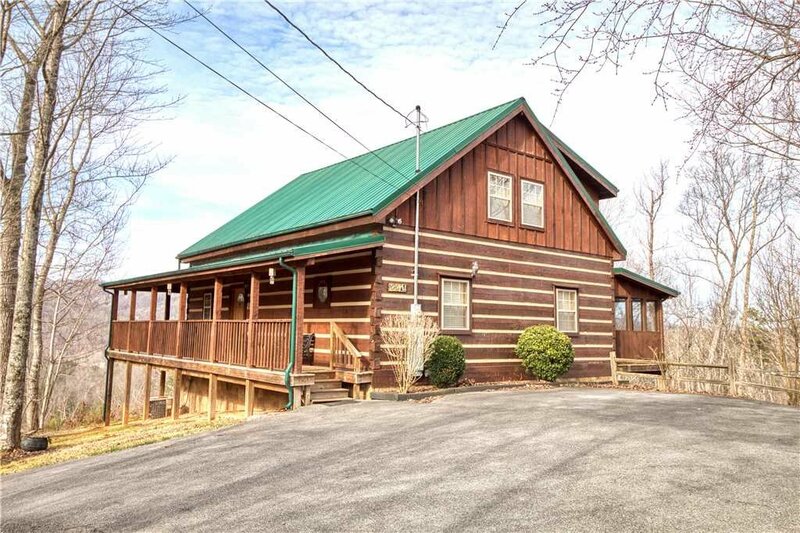 It even features authentic log cabin chinking and a wraparound porch overlooking mountain vistas. 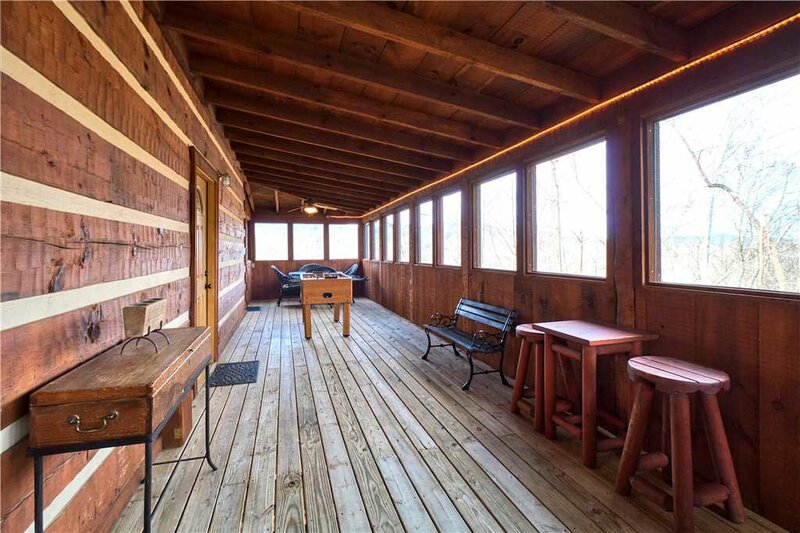 Your wraparound Covered Porch surrounds the cabin on three sides. 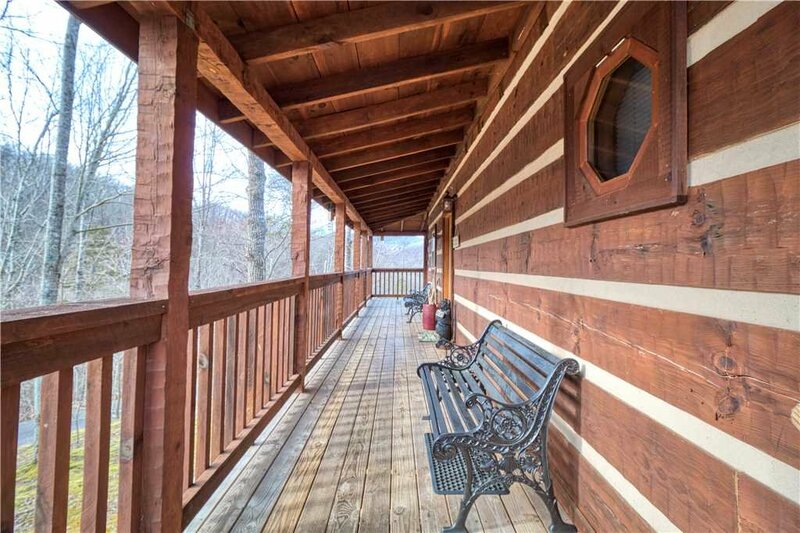 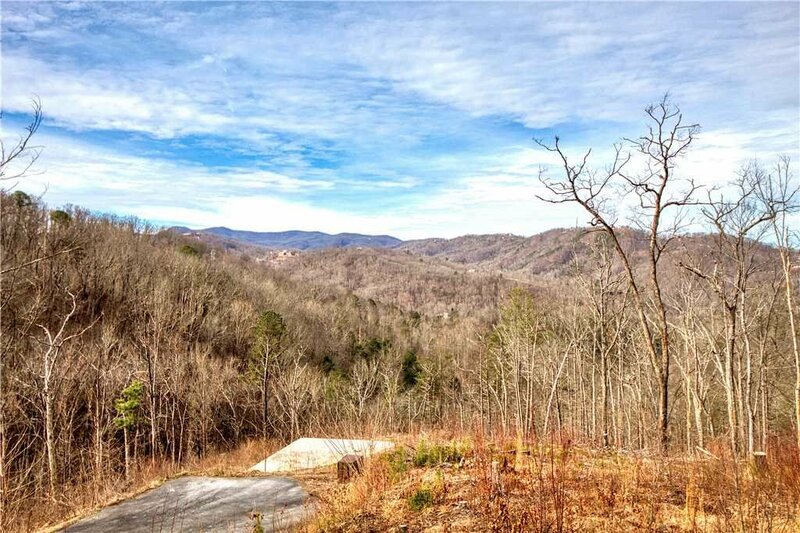 Sit on the side porch and enjoy the privacy and the fantastic mountain view. 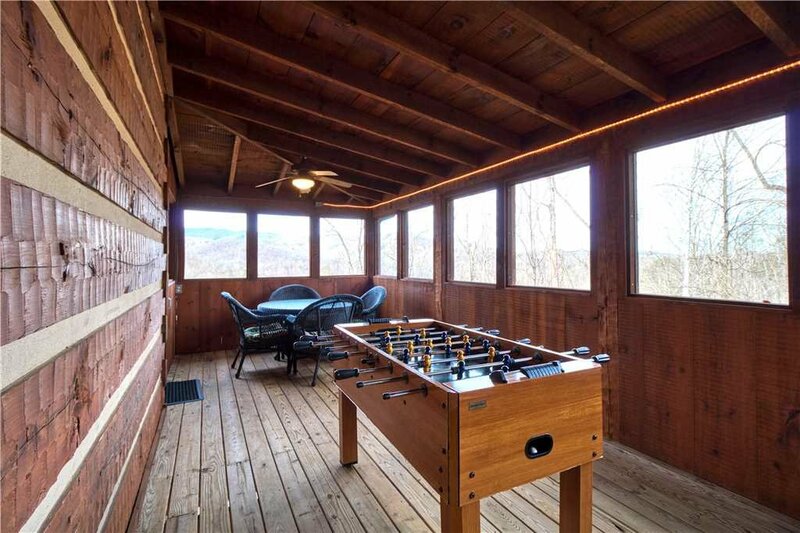 You and your group will make many wonderful memories in the screened-in back porch playing Foosball, dining outdoors, and soaking in the hot tub. 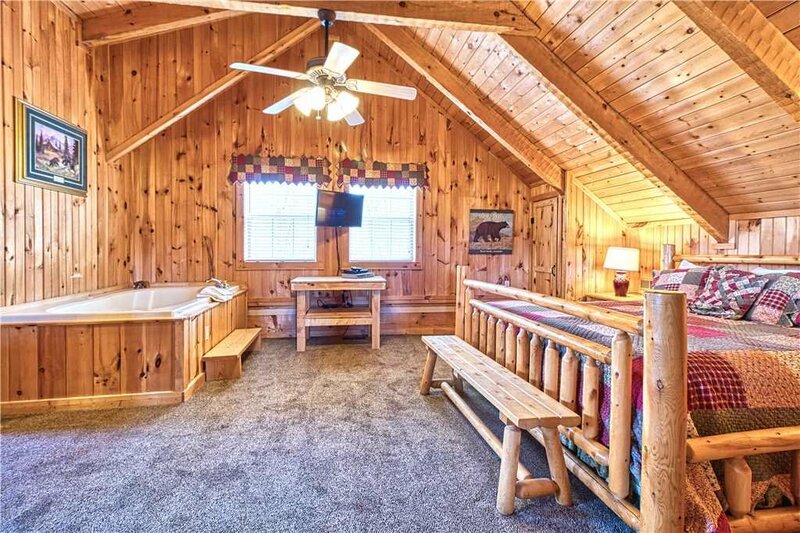 You enter Chubby and Cubby’s Den through the kitchen and dining area. 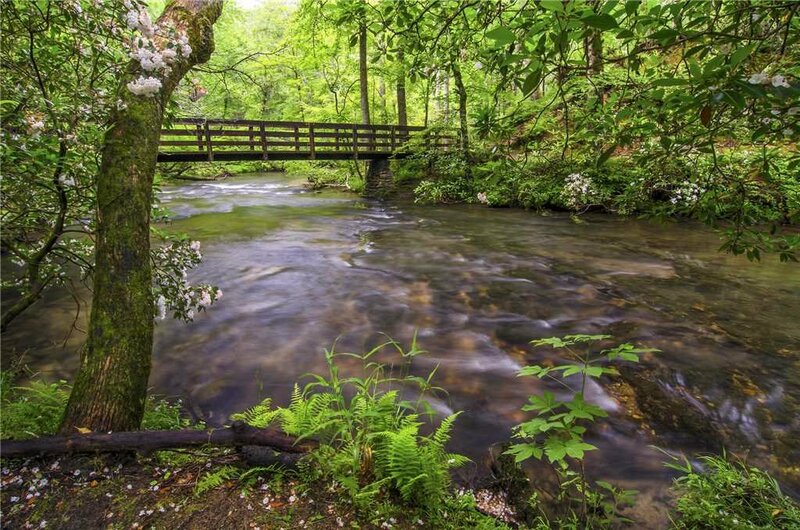 The deep ties to nature are immediately in view. 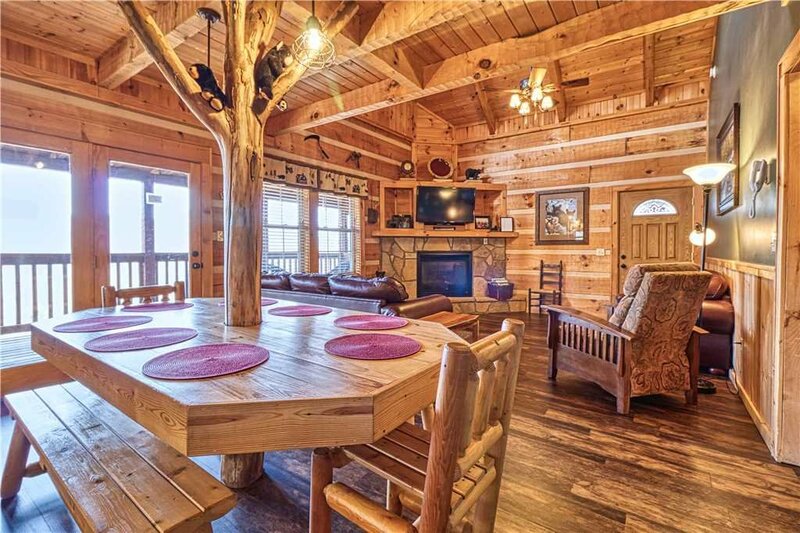 Natural wood walls and finishings set the tone that’s carried out in a dining room table built around a Sycamore trunk. 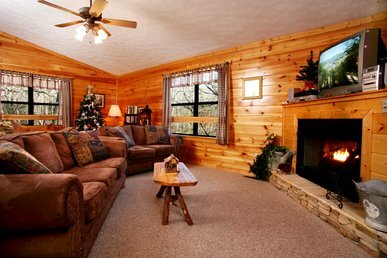 Your Chubby and Cubby’s Den living room is so cozy. 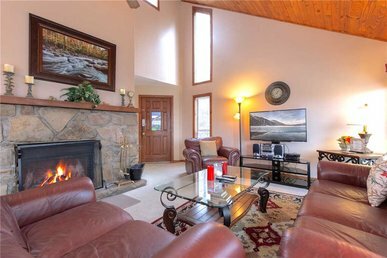 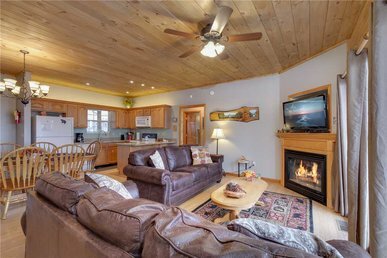 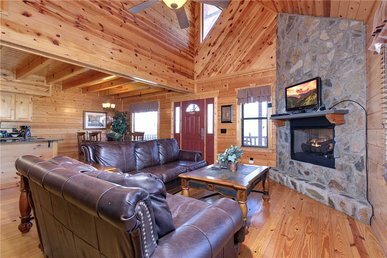 You have a stone fireplace with gas, a leather couch and loveseat and a recliner all positioned to provide a great view of the flat-screen TV with cable and a DVD player. 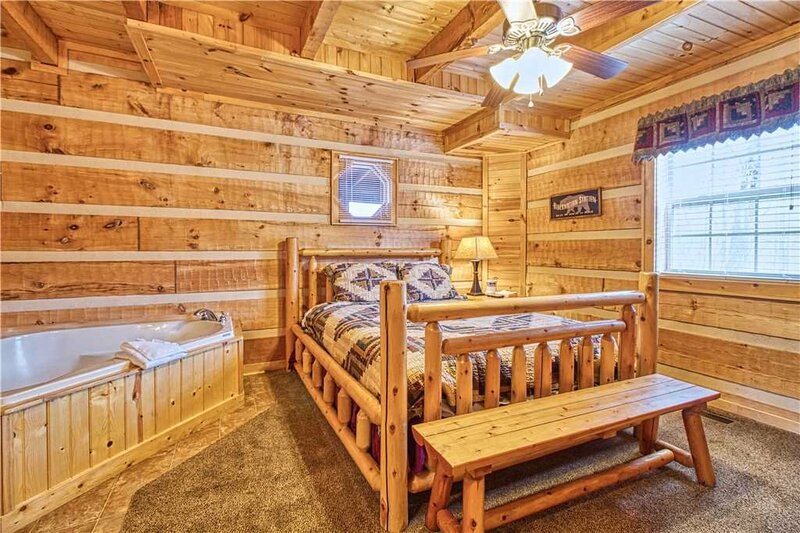 You also have a CD player and free Wi-Fi within the cabin. 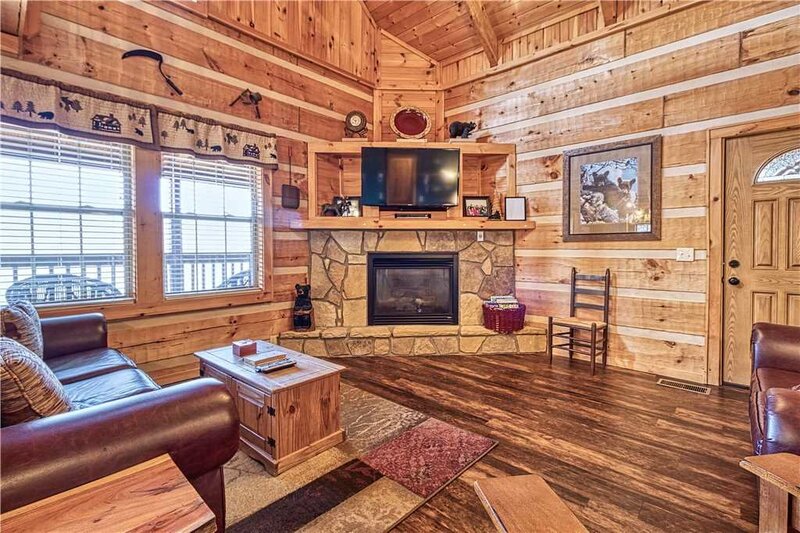 All four TVs in the cabin are Smart Screen TVs. 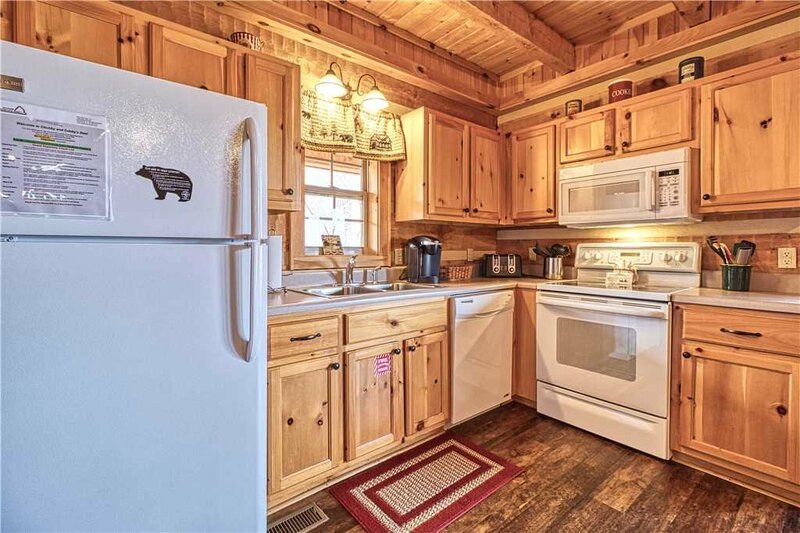 You have a fully-equipped kitchen within Chubby and Cubby’s Den. 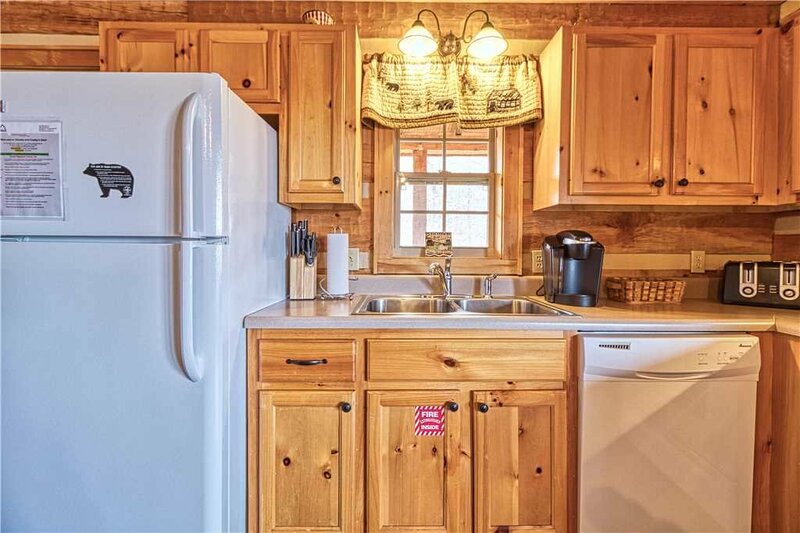 Just bring your favorite recipes and pick up ingredients at a local grocery. 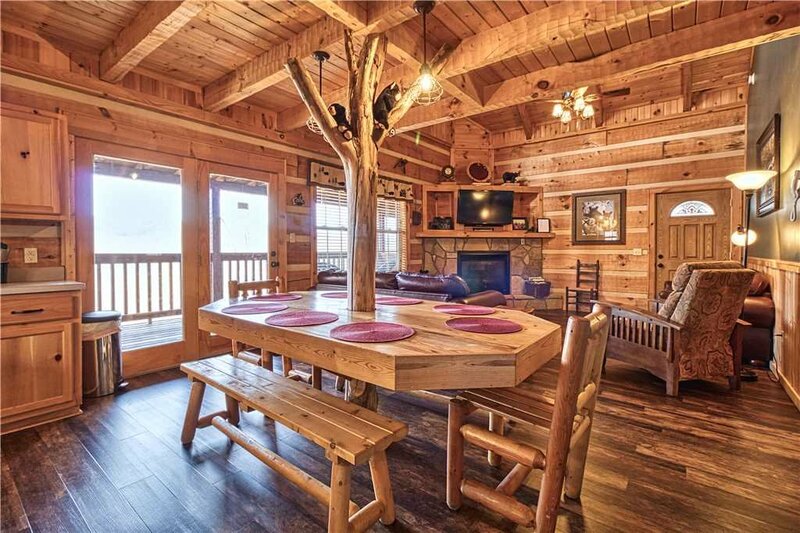 What fun it will be to dine around the table encircling the Sycamore tree. 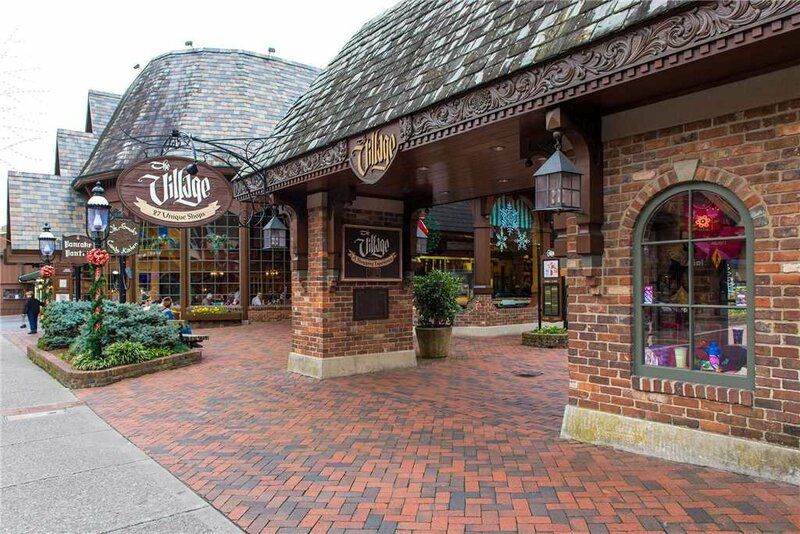 Of course, you can always make the short drive down to Gatlinburg where you’ll find many restaurant choices. 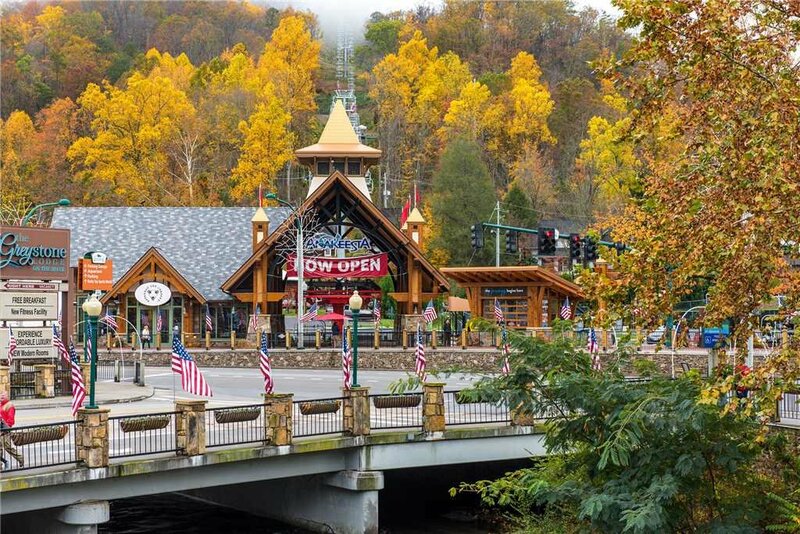 While you’re in town, be sure to stop by Anakeesta outdoor amusement center where you’ll find zip lines, a canopy walk, and a gondola ride up a 600-foot mountain. 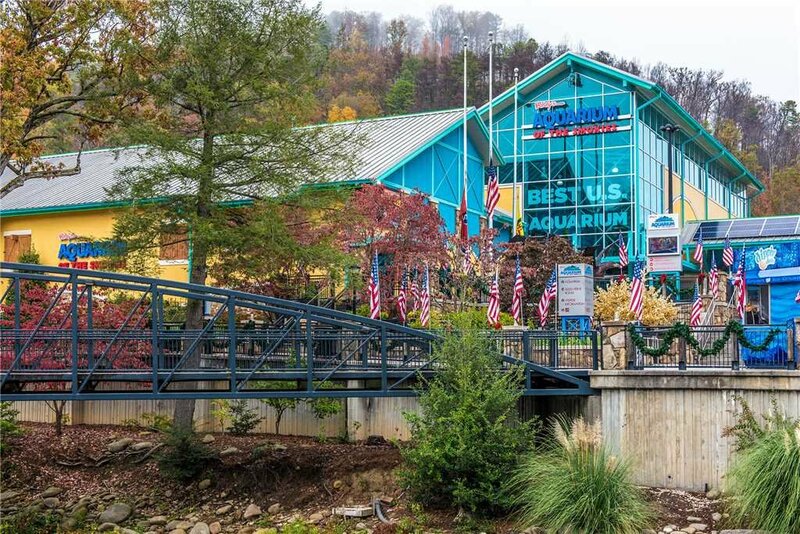 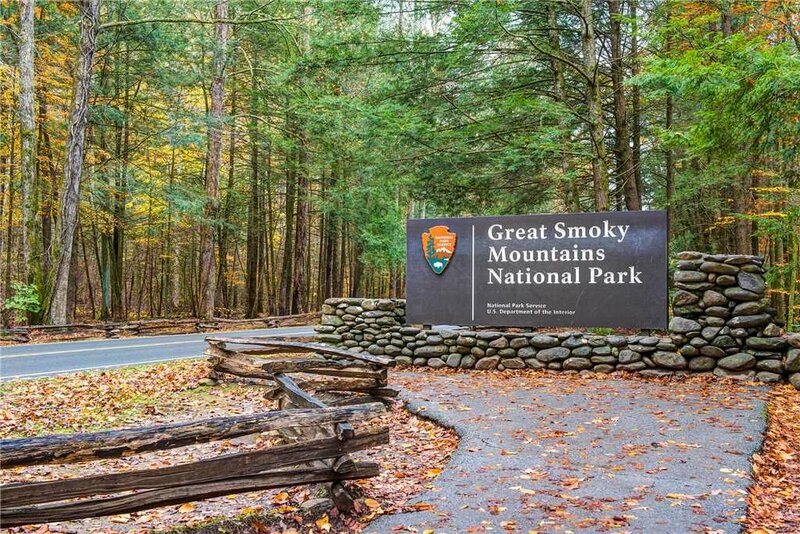 You’ll also find interesting shops, museums, galleries, and Ripley’s Aquarium of the Smokies in downtown Gatlinburg. 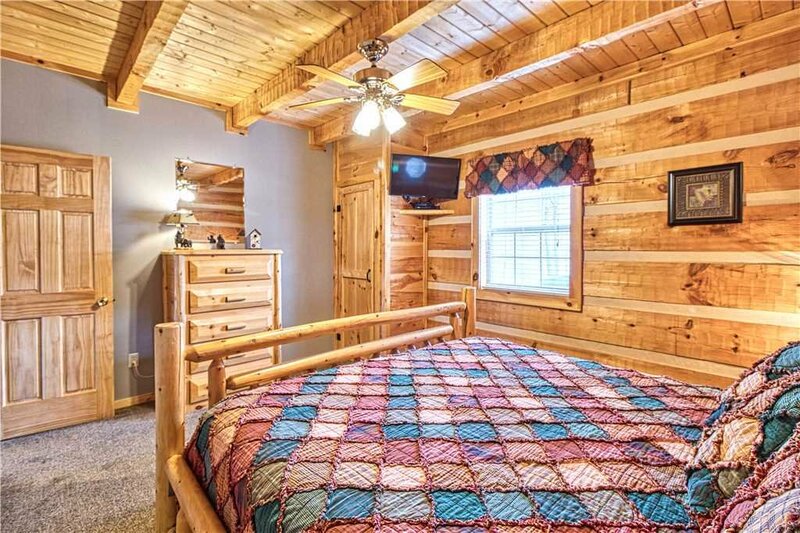 The other main-floor bedroom includes a King-sized bed with dresser and a wall-mounted flat-screen TV. 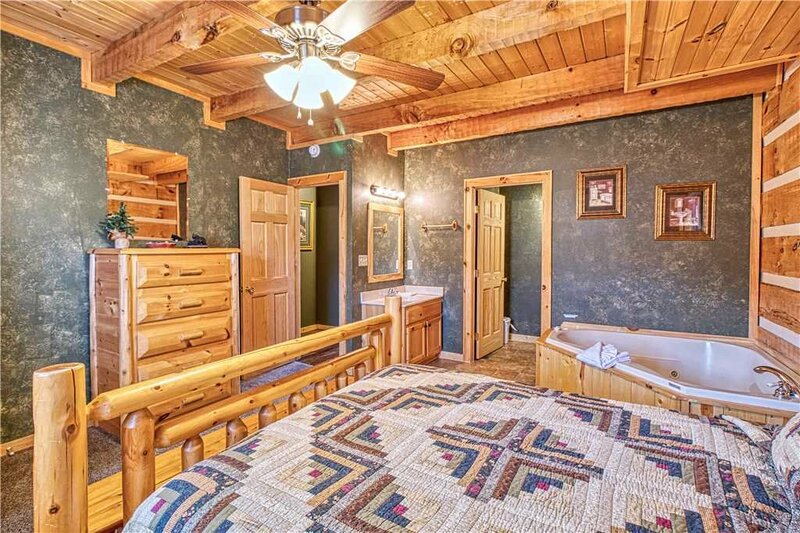 The en-suite used by guests staying in this handsome room includes a shower/tub combination. 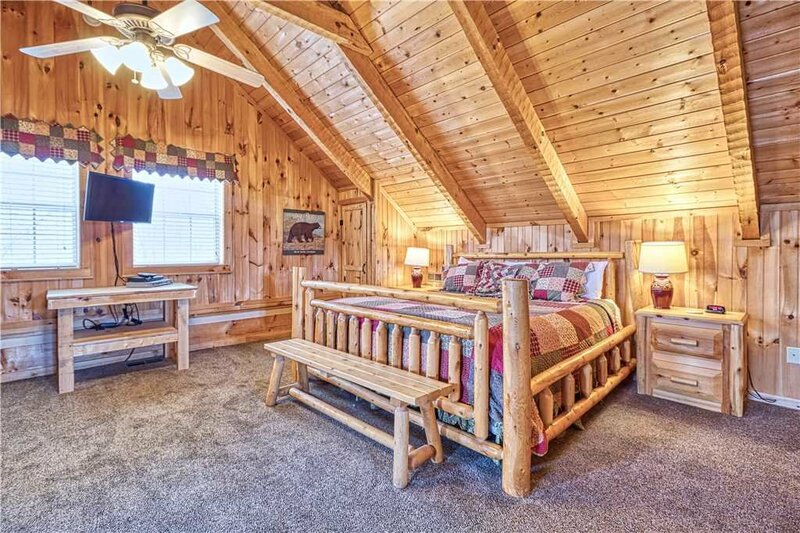 Upstairs is the Chubby and Cubby’s Den master bedroom suite. 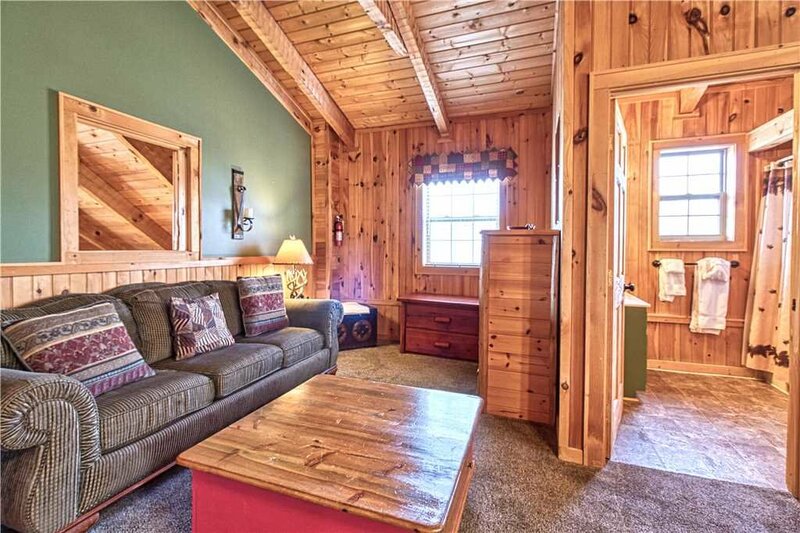 What a peaceful oasis awaits you! 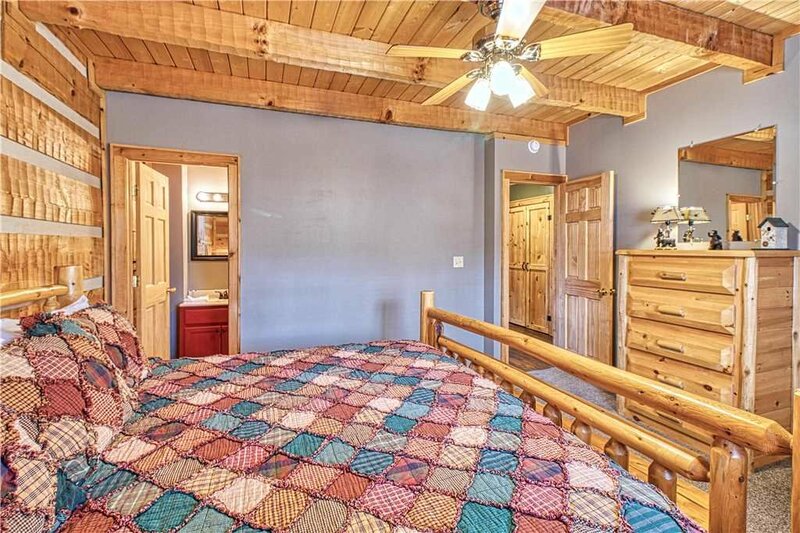 Your king-sized bed is positioned to give a great view of your wall-mounted flat-screen TV. 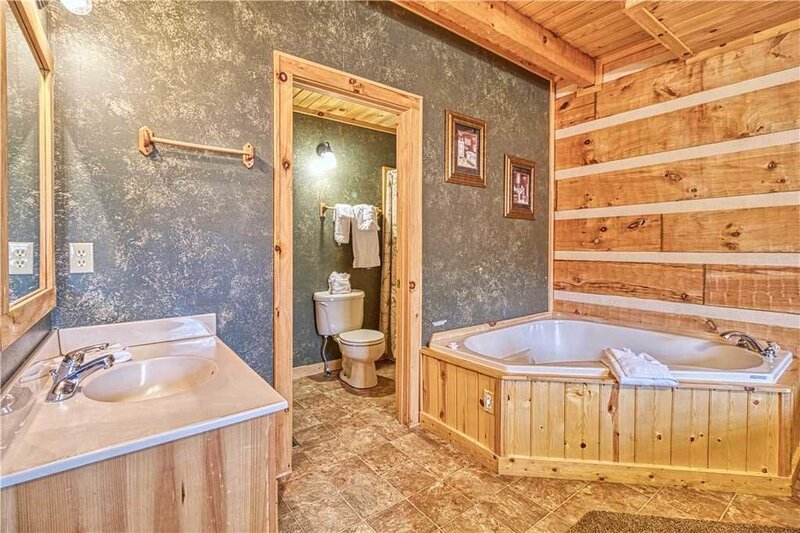 You also have a Jacuzzi tub and a couch perfect for reading or a one-on-one conversation. 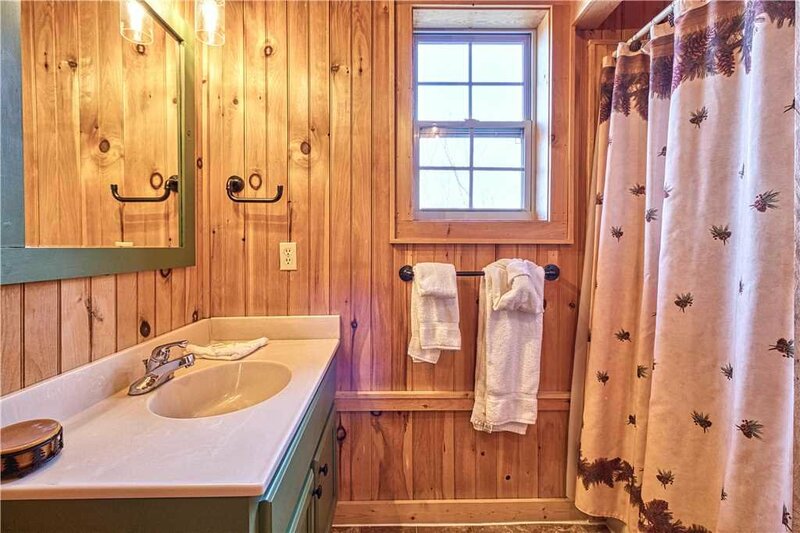 Your master bathroom includes a walk-in shower and vanity with space to store your toiletries. 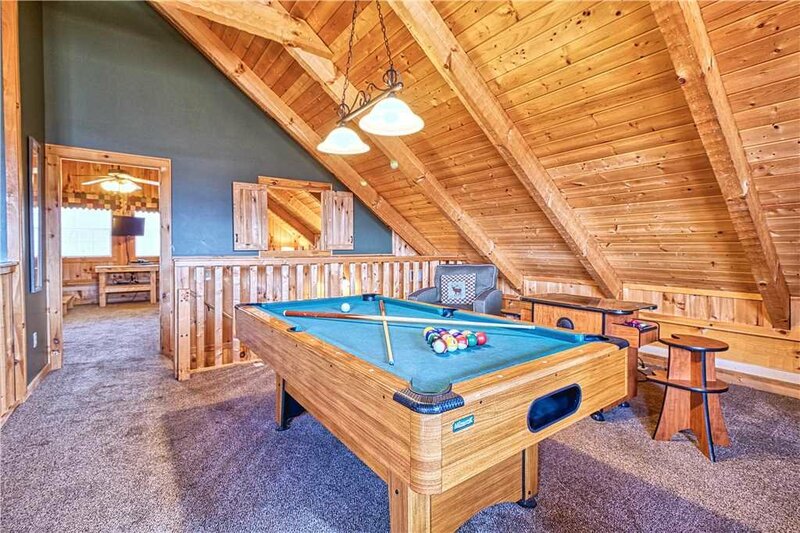 Also on the upper floor, you’ll find a pool table and a video game console. 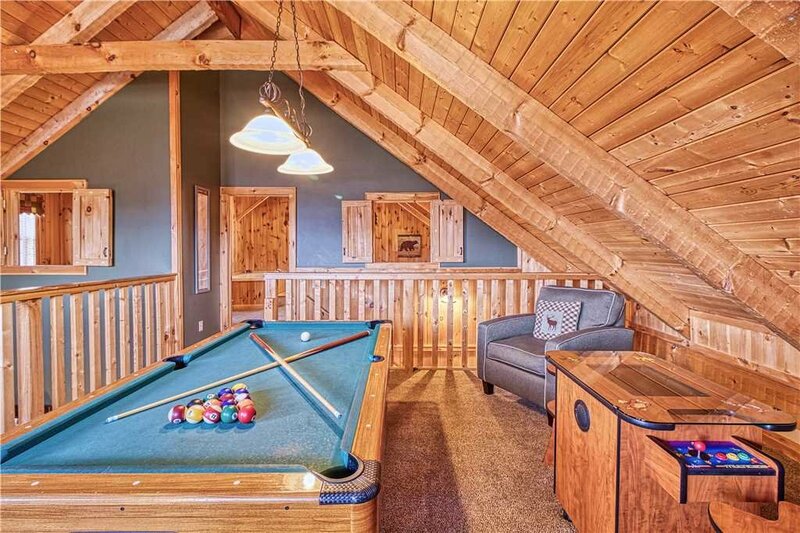 Challenge your guests to a friendly pool tournament. 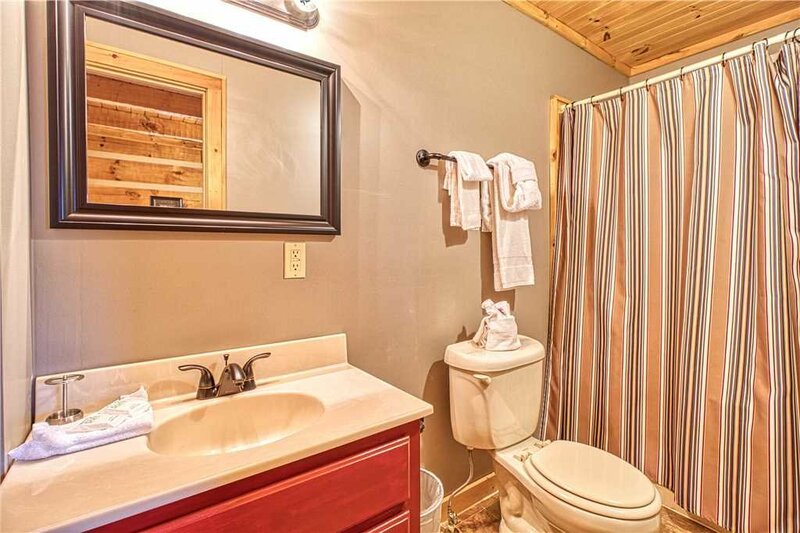 The video game console will provide hours of entertainment. 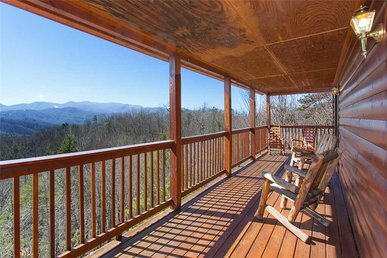 There’s also a covered balcony off the poolroom where the mountain view is even more spectacular. 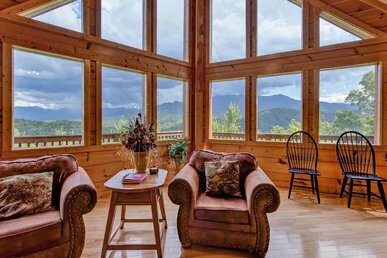 You can enjoy your morning coffee as you listen to the songbirds serenade you. 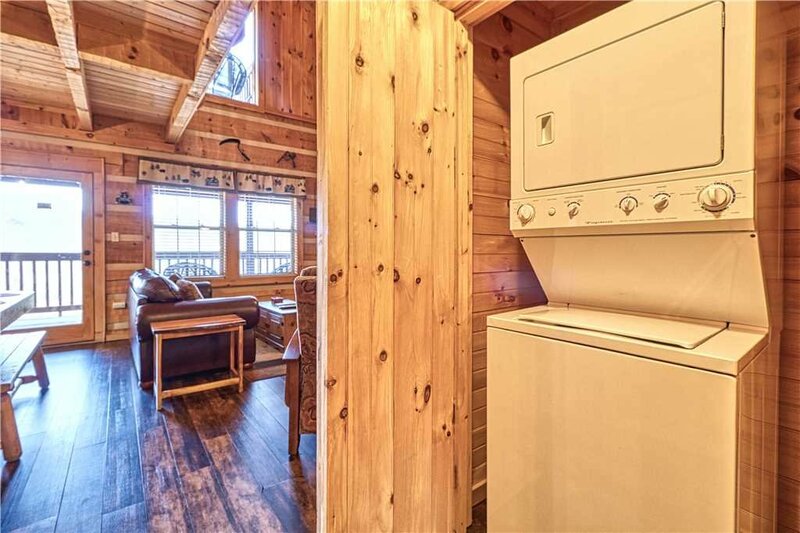 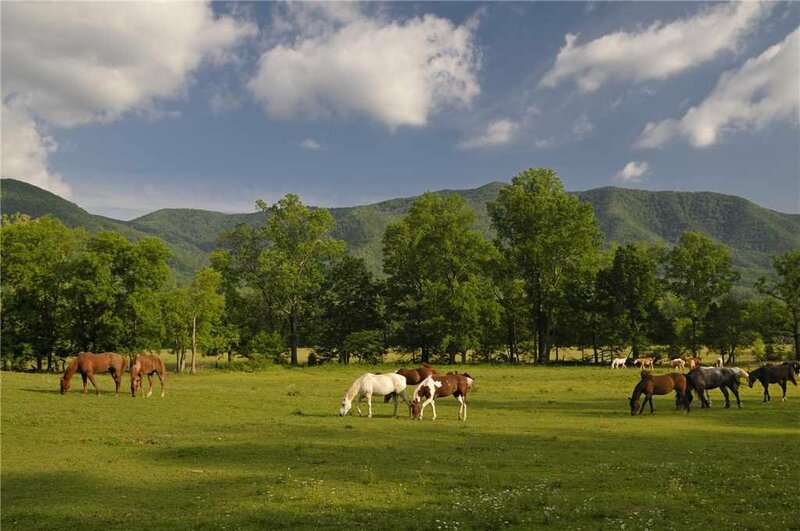 Chubby and Cubby’s Den also has a washer and dryer so you can keep your group in clean clothes throughout your stay in the Great Smoky Mountains. 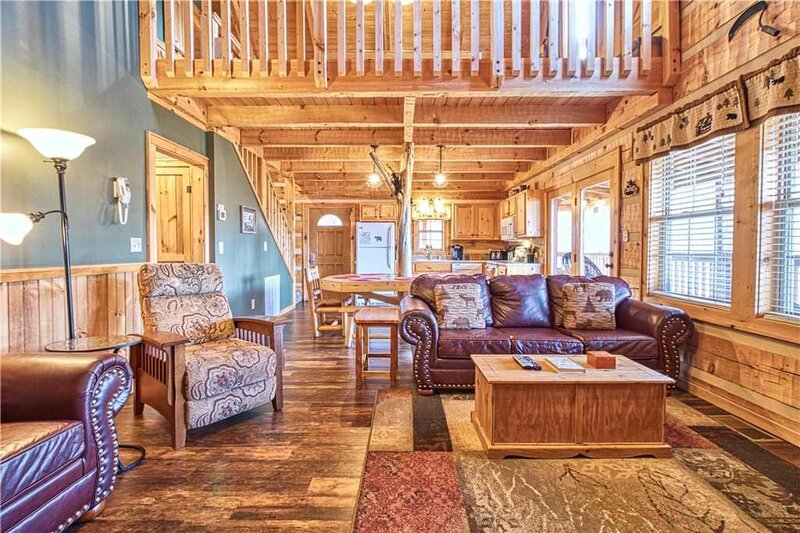 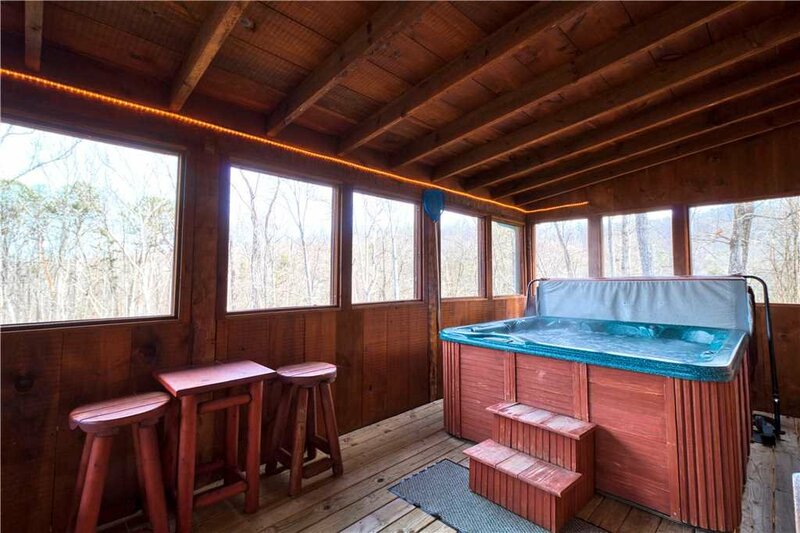 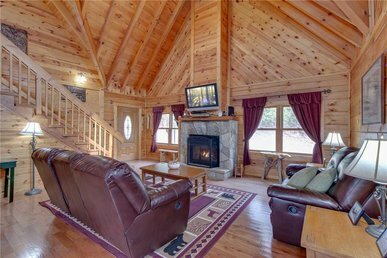 Chubby and Cubby’s Den is the vacation cabin you’ve been looking for near Gatlinburg. 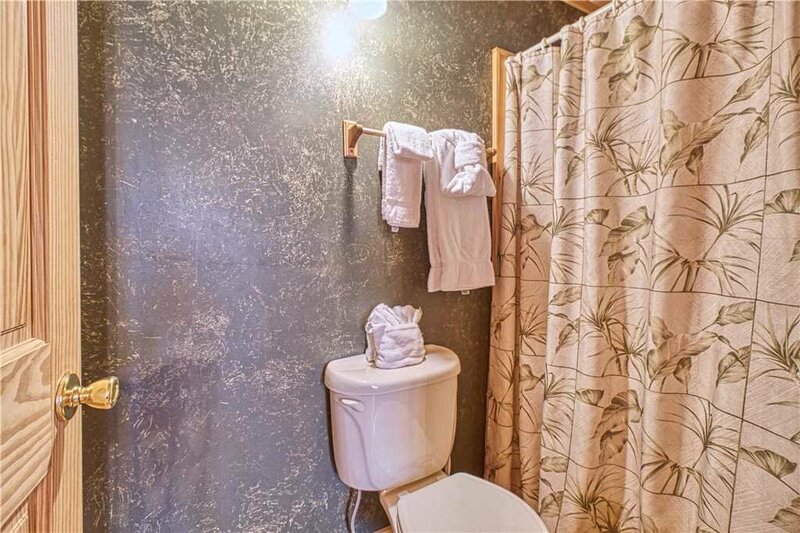 Take a moment to reserve your preferred dates today.